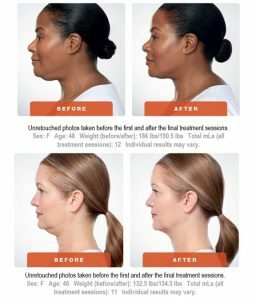 KYBELLA® is the first and only FDA-approved injectable treatment to improve the appearance of moderate to severe fat beneath the chin (submental fullness) by physically reducing fat cells. Kybella is an ideal treatment for anyone who wants to eliminate fatty areas on the neck and chin. When properly injected in the submental area, Kybella has been shown to dissolve the fat that causes double chin. The result – a more streamlined neck and enhanced contour along the jawline. Contact our clinic today to learn more about this procedure and to schedule your appointment. *Procedure results are typical and may vary. It is not known if KYBELLA® is safe and effective for use outside of the submental area and in children under 18 years of age.